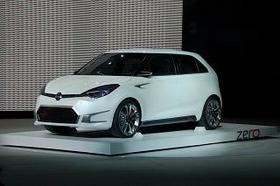 The production version of the Zero concept, shown, will debut later this year as the MG3. Shanghai Automotive Industry Corp. has opened its MG Longbridge design center near Birmingham, England, in a step toward expanding the British marque in Europe and China. Shanghai Auto spent 3 million pounds ($4.4 million) on the studio, plus 1.7 million pounds on an engine test center that will open later this year. In a statement, MG Design Director Tony Williams-Kenny called the studio "a huge step forward for us… We will be finalizing all details of the new MG6 from this studio and it gives us superb tools and facilities to go further forward on projects such as the MG Zero concept and beyond." The Zero, which was shown at the Beijing auto show in April, is a five-seat hatchback. The production version of the Zero will be dubbed the MG3, Edmunds Inside Line reported in April. It will debut later this year with a choice of 1.3-liter and 1.5-liter engines. In China, the vehicle will be sold as the Roewe 150, Edmunds said. The MG6 is a sporty five-door fastback to be launched late this year. A sedan version will follow in 2011. MG says the new studio will employ 20 designers. It is located on the same campus as Shanghai Auto's European engineering technical center, which employs 280 workers. MG Rover came under Chinese ownership in 2005, when it was acquired by Nanjing Automobile. When SAIC purchased Nanjing Auto in 2007, it acquired MG Rover as part of the deal.